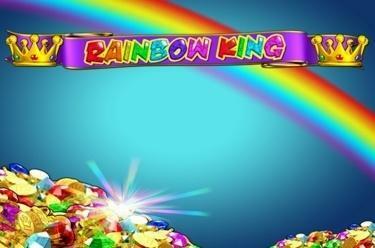 Play Rainbow King™ online for free now! It’s colourful and turbulent with Rainbow King™! Here the jewels and crowns glisten and sparkle, and the rainbow king’s treasure chamber is filled with tons of diamonds. And the best part? The friendly monarch will willingly give you his wealth! Let the reels spin and collect winnings without end on 20 lines and in 3 bonus features! Your aim: Make sure to land 5 matching symbols along an active win line. The winning pattern consists of several win lines, which run across the reels differently. You win if several identical symbols land along the same win line side by side from left to right without being interrrupted. The ‘WILD’ symbol (Joker) substitutes all other symbols except for the Rainbow King, the Crown and the Castle. Rainbow King Feature: 3 or more Kings start the Rainbow King feature. Roll the dice to move the figure on the board forward. Each field holds different prizes for you! 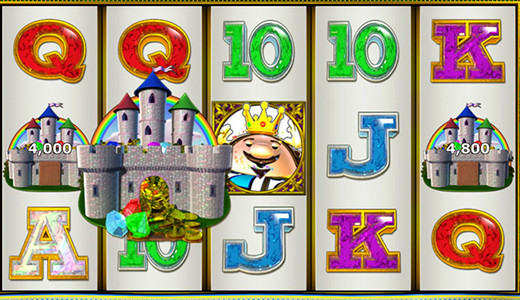 Should the piece land on a Rainbow King Field, a small slot is activated, which you can play on as soon as your character lands on a ‘Take The Money’ field. King Cash Feature: 3 Crowns activate the King Cash Feature. Select one of the 12 Crowns and get a random prize! Cash Castle-Feature: 3 or more castle symbols start the Cash Castle Feature. Select a castle and pillage the treasury!